San Diego, Calif. – In recognition of exceptional PreK-12 teachers, National University joins the San Diego Padres in honoring San Diego County teachers as the presenting partner of the Padres’ Annual Teacher Appreciation Night at their May 11 game against the St. Louis Cardinals at Petco Park. Friday, May 11, NU President Dr. David Andrews will congratulate the new San Diego County District Teachers of the Year. 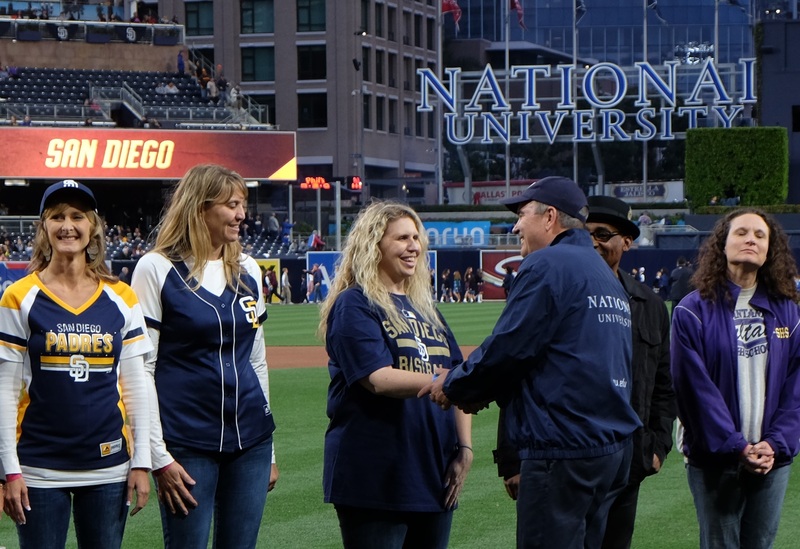 During an on-field presentation, the Padres and National University will recognize San Diego County’s 46 newly-named District Teachers of the Year, as well as the reigning 2018 Teachers of the Year. 18 of the newly-named teachers are graduates of National University’s Sanford College of Education. During Friday’s game, National University will be hosting teachers and educational leaders who are alumni of its Sanford College of Education, which is known for its commitment to quality teaching, as well as its prominence in serving a diverse student population. Over the past 20-plus years, more than 100 National University alumni throughout the state of California have been recognized as teachers of the year at the local, state and national level. The University will also host a live broadcast on its Facebook page during the event, featuring Hall of Famer Trevor Hoffman and National University alumni who’ve earned the honor of Teacher of the Year. In addition to its teacher education programs, National University is also supporting ongoing teacher development through its role leading the national expansion of two research-based programs that address student development and achievement. The programs are Sanford Harmony (PreK-6), a social emotional learning program for PreK-6 classrooms now reaching more than 1 million students, and Sanford Inspire (PreK-12), which offers training modules that feature research-based teaching approaches to create inspiring classrooms. Both programs are being disseminated nationally through National University and the National University System, and with the generous support of philanthropist and entrepreneur T. Denny Sanford.